The concept of noise pollution, or the idea of blasting horns being an infringement of the public’s right to quiet, is nonexistent in Cairo. If anything, the opposite is true. There is a feeling that each individual has to make his or her own contribution to the general noise, as though the number of decibels is still insufficient. Everyone and everything is involved. 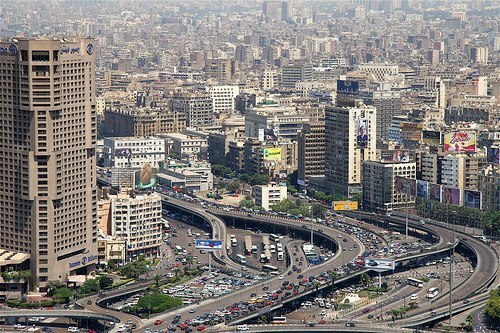 Despite the recent growth in the number of automobiles, the donkey still remains an important means of transportation in Cairo. Gentle beasts, their heads bent slightly forward and their long eyelashes pointed modestly to the ground, they seem capable of carrying loads many times their own weight. “Homar,” the Arabic word for donkey also has the meaning of “idiot.” While, personally, I am loathe thinking of them that way, I must admit that a donkey’s foolish-sounding and high-pitched “hee-haw,” which can easily grate on one’s nerves, is extremely idiotic. And when an Egyptian is speaking on the telephone, it is quite easy to hear what the person on the other end of the line is saying. They YELL to each other over the line. It does not matter if they hold the receiver in a normal way or if they hold the receiver six inches away, they YELL! The fact that sound does not carry easily in the boundless wastes of the desert may be one reason why Egyptians insist on being so loud. Speaking quietly is ineffectual, and therefore loud voices are cultivated naturally. I do not know if this explanation is true, but it seems plausible.